First up the chutney dip, which can be made well in advance. Place the peppers on a baking tray and bake for 30 minutes until they are slightly charred. Meanwhile, prepare the tomatoes. Lightly scoring a cross on the bottom of each tomato, then plunge them into boiling water for 1 minute, then straight into ice cold water. Peel the skin off the tomatoes & discard. When the peppers are cooked and still hot, put them in a plastic sandwich bag and leave to cool. Once cool, take the peppers out of the bag, then deseed. Once deseeded using the back of your knife peel/scrape off the skin and discard. Chop the tomato & pepper flesh into even size pieces then add to a heavy bottom saucepan with the remaining chutney ingredients. Place over a very low heat with the lid on for around 1 hour or until its thickened nicely. Store in a clean sealed container. On to the Dough Balls! Mix the luke warm water with the yeast & olive oil. Leave for around 10 mins until slightly bubbly. Meanwhile, Place the flour and salt in a large mixing bowl. Make a well in the middle then add the water & yeast mix. Stir until the mix starts combining. You will have to get your hands involved..But its worth it!! Once everything is together, place the dough on a lightly floured work surface. Now its time to knead. So roll up your sleeves and work that dough. You want to knead for around 10 minutes. The dough should be smooth and quite elastic after the 10 mins. Put the dough back into the mixing bowl this time make sure you have light oiled the bottom and sides of the bowl. Place a clean damp towel over the top of the bowl and leave somewhere warm for around 1 hour or until its double in size. After an hour, remove the dough from the bowl. It should feel beautiful and light. I love this part. Knock the dough back and knead for around 5 minutes. Line a baking tray with greaseproof paper, in the middle place a lightly greased ramekin, this will eventually be the place for your chutney pot. Cut the dough into approximately 25 even sized pieces, I used my weighing scales and made sure each piece was 35g. 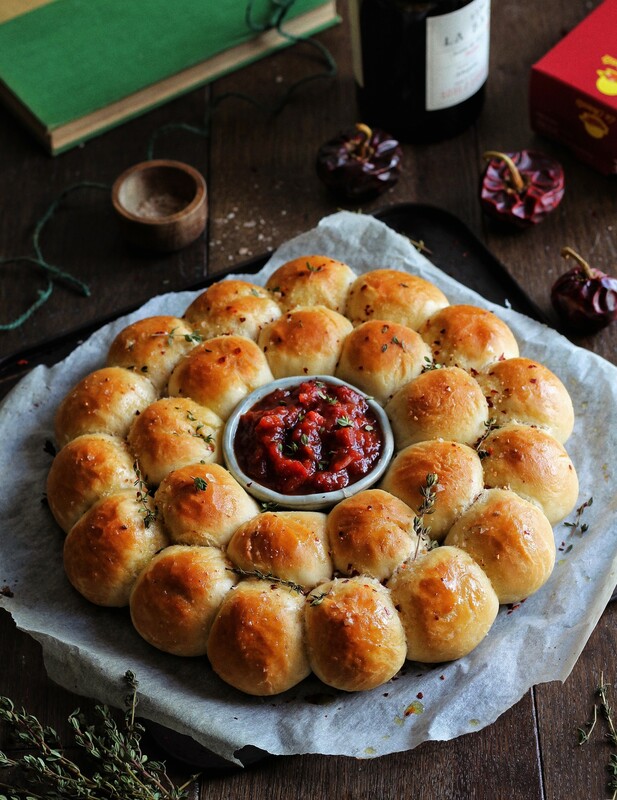 Roll each piece into a ball, the best way of doing this is by placing one hand on top of the dough ball on the surface, applying pressure & moving your hand in a circular motion. Neatly place the balls around the ramekin. Once complete, place the damp tea towel over the top and leave the dough somewhere warm to double in size. This should take an hour. Mean while mix together the glaze ingredients & prepare the toppings. After an hour, using a pastry brush, brush the glaze over each dough ball and sprinkle over the toppings. Bake for around 40 minutes in a 180 degree oven. Once baked and slightly cooled remove the ramekin from the middle and place in your pot of chutney.